What are the security implications of climate change? What has the U.S. Navy said about climate change risks? How many climate change refugees are forecast, and by when? What’s the national security “worst case” for climate change? How is national security a key feature of climate change as a wicked problem? 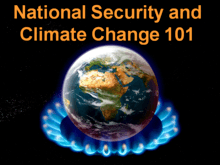 The National Security and Climate Change 101 Doorway is your guide to exploring these and other questions in the Climate Web.